The Chamber’s annual Christmas Dinner will be on Wednesday, November 28, 2018 at the Capilano Golf & Country Club from 6:00 pm to 10:00 pm. 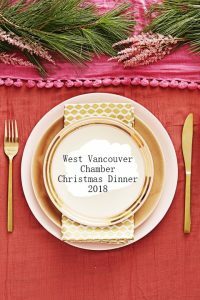 Guests can enjoy a Champagne Reception to begin the evening, in the beautiful Stanley Thompson Room of the Capilano Golf & Country Club, followed by the fabulous Capilano Golf Club’s Christmas buffet. We couldn’t host this party without your generous sponsors – Thank you!